Hello and thank you for visiting our ScreenCloud Help Center. This article will go through how to add your screen into your ScreenCloud account. 1. 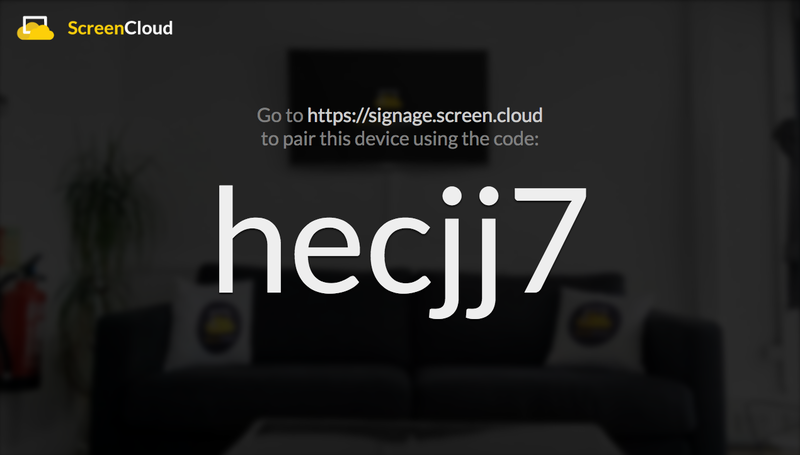 Visit the app store on the device you have connected to your television and search for "ScreenCloud Signage". Select this app and download it to your device that is connected to your television/display. 2. Once the ScreenCloud app has loaded on your device, you will see a pairing code that looks a little like the below. When you have this, open https://signage.screen.cloud/ on your laptop or PC and sign up for a ScreenCloud account (if you haven't already). 3. Once you’ve signed up, you can choose Add Screen from the screen below. Enter your pairing code from the previous step and that’s it! You can now run content on your screen from your PC or laptop anywhere in the world. If you have any additional questions or concerns on adding a screen into ScreenCloud, or any other questions or feedback about ScreenCloud, feel free to reach out to our support team at support@screencloud.io or give us a call at +1-415-449-5426, then follow the prompts to connect with support.